Eden Hazard was presented with a chance to double Chelsea’s lead against Huddersfield on Saturday, and he made no mistake from the penalty spot. Gonzalo Higuain had broken the deadlock earlier in the first half with his first goal for the Blues, and as Maurizio Sarri was hoping for a positive response after their defeat to Bournemouth in midweek, he was given a two-goal cushion heading into the break. 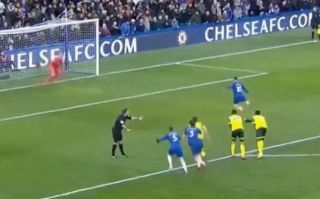 As seen in the video below, Hazard stepped up and drilled his effort into the back of the net with minimal fuss, sending the goalkeeper the wrong way to bag his 14th goal of the season. With Higuain and Hazard finding their goalscoring boots, it will certainly make life easier for Chelsea, with Sarri undoubtedly under pressure after recent defeats to Arsenal and Bournemouth, with their goalscoring woes certainly an issue to this point.